Because your life is on the line!! 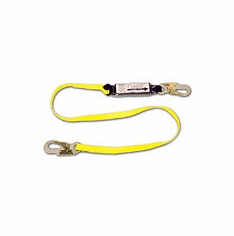 Most FrenchCreek Production shock absorbing lanyards are six feet in length as a standard. This makes a great measuring stick for workers, limiting free-fall distances to regulations of six feet or less (6' free-fall rule). 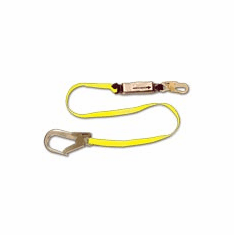 Most lanyards can be modified for varying lengths and applications, if needed. FCP shock absorbing lanyards are made with pride in the U.S.A., and are comprised of nothing but the toughest materials. With tensile strengths from 5,500 to 10,000 lbs, they are rated far beyond OSHA and ANSI requirements! Many different styles, options, and lengths are available, offering literally thousands of combinations to choose from. Choose the lanyard combination that is right for you and the needs of your job! We design, test, and manufacture every product as if it has to save a life, because it does! Our commitment to quality has led to practical solutions that puts your safety first. FrenchCreek products meet or exceed all applicable fall-protection standards in the U.S.A., including OSHA Subpart M, ANSI A10.14-1991, and ANSI Z359.1-1992.